In the late twentieth century and the early twenty-first, various groups, organizations and governments worked to restore parts of the Truckee River, its tributaries and wildlife to a more natural state, akin to what they were before the white man arrived. These groups sought to undo, as much as possible, damage done by logging, ranching, and the straightening and dredging done by the U.S. Army Corps of Engineers from 1959 to 1968 during a flood-control project. Of course, there was much that the restorers could not change, including the series of large upstream dams built from the beginning of the twentieth century through the 1960s and 1970s, as well as the channel-narrowing through downtown Reno. Still, considerable potential remained for “re-naturalization.” What could be changed would be. By the 1990s there was growing interest in reversing this unhappy history. In 1993 a Lower Truckee River Restoration Committee organized itself, determined to restore the aquatic and riparian ecosystems. 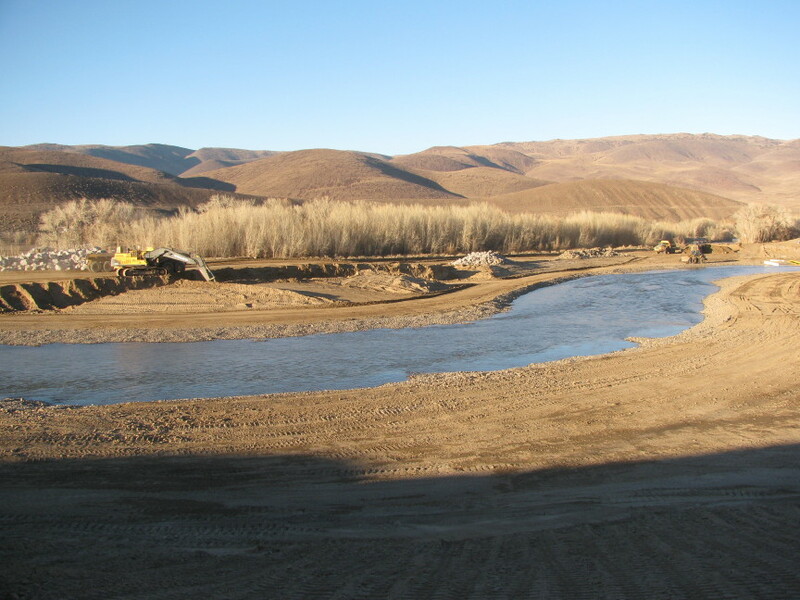 It sponsored several projects, including fencing a five-mile reach, planting cottonwoods, creating wetlands, and building a migratory fish bypass at Numana Dam on the Pyramid Lake Reservation. It also established a managed river corridor where river dynamics essential to the river’s health could be displayed and studied. The steering committee initiated hydrologic studies, with recommendations to follow after their completion in 1997. The membership of the committee offered a good indication that this would be a serious effort; it included the Pyramid Lake Paiute Tribe, the Nevada Department of Environmental Protection, the Nature Conservancy, the federal Environmental Protection Agency, Fish and Wildlife Service, the Corps of Engineers, Bureau of Reclamation, and Natural Resource Conservation Service. The committee believed that the release of water from Stampede Reservoir to assist fish spawning had greatly improved conditions under which cottonwood seedlings could thrive, and following record precipitation in 1994-95, an attempt was made to re-establish them as part of an experiment. Even though the summer proved extremely dry and many seedlings died, quite a few did survive where moisture lingered. In 1996 Chad Gourley of the Conservancy wrote at length in The Truckee River Times about what needed to be done. In part he said “Re-establishing a broad, dense zone of riparian vegetation will be the key criterion for restoration of the Truckee River. Most of the significant changes in both the river and adjacent terrestrial environments are related to the decline of the riparian forest. As a result of decreasing willow and cottonwood densities and loss of understory vegetation, the river channel has become wider and shallower. But well-developed bank vegetation can significantly reduce channel width, increase its depth and also decrease water temperatures [which were unhealthy for fish when too warm]…. Successful restoration will not only require changes in the annual flow pattern, but also changes in land management, such as reducing livestock grazing, preventing wood cutting, and decreasing conversions of riparian forest into other land uses.” He noted that while the committee had begun testing a new fish ladder design that would give Pyramid’s prehistoric cui-ui a better chance of swimming upstream than did the traditional ladders at the Marble Bluff and Numana dams, more was needed, including the constriction of wetlands. These efforts would receive a major boost from the following year’s disastrous flood. When, in response, a Living River flood-control project was endorsed by a Community Coalition in 2001, it offered an opportunity to undo some of the environmental harm through a major component, the Truckee River Ecosystem Restoration Project. The goal was to restore fifty miles of the ecosystem from Sparks to Pyramid Lake; restore fisheries; enhance deer, mountain lion, duck, and song-bird habitat; improve water quality; and provide greater opportunities for recreation, river access, and open space. In certain key areas, the river’s original meanders would be restored and its banks re-vegetated. The meanders would slow the flow of water, which would raise its level and create a better habitat for vegetation; this vegetation would shade the water and cool it, improving spawning. The meanders would also reduce turbidity, stabilize the banks, and reconnect the river to its floodplain so flood waters could spread naturally, reducing damage downstream. The project also proposed improving fish passage and spawning by removing diversion dams that blocked fish passage, and installing fish ladders at the Marble Bluff, Numana and Derby dams. Finally, it relied on the pending Truckee River Operating Agreement to provide a dedicated streamflow during dry seasons. At its inception, the effort was predicted to take ten years at a cost of $140 million and involve work at eleven sites. The primary project partners included Washoe and Storey counties, the cities of Reno and Sparks, the Army Corps of Engineers, the Pyramid Lake Paiute Tribe, the U.S. Fish and Wildlife Service, the Reno-Sparks Indian Colony, the University of Nevada-Reno, the Reno-Tahoe Airport Authority, the Bureau of Land Management, and the Nature Conservancy. Many other agencies also became involved. Of all these, the conservancy was central. In the meantime, in 1999 it had hired a coordinator for its attempt to acquire floodplain lands for lower-river restoration. As a first project, the conservancy embarked on the 305-acre McCarran Ranch site east of Sparks, which it acquired in late 2000. This was not part of the Living River Flood Project per se, but it exemplified the project’s goals. Over the next several years, the conservancy cut a new meandering river channel to replace what it called the Corps’ “200-foot-wide ditch” with its “isolated pockets of aging cottonwoods, truncated deer corridors and a nearly lifeless stream.” It re-created eleven wetlands; stabilized the banks; raised the gouged-out riverbed; built fifteen fish-friendly riffles “with enough rocks to cover three football fields 10 feet deep”; and planted more than 15,0000 cottonwoods and other plants including buffaloberry, sedge, woods rose, and bulrush over 120 acres. Wiregrass and frogs returned, as did rainbow and brown trout, and many bird species including a willow flycatcher that came to breed for the first time in thirty years. The western bluebird was also spotted here and in other restored areas. An amphitheater was built. In all, five miles of riverfront were restored. In September of 2012, during the Nevada Department of Wildlife’s annual fish survey, biologist Chris Crookshanks said the restoration had created an absolutely fabulous fish habitat. Also importantly, tall whitetop, an invasive and destructive weed, largely disappeared. Whitetop, the common name for the perennial pepperweed (Lepidium latifolium) had, by the 1990s, overrun thousands of acres near the Truckee and threatened alfalfa crops in the Newlands Project. It spread rapidly because it exudes a substance that kills other plants, and is difficult to eradicate. This difficulty was exacerbated by the fact that the best time to kill it with herbicides is in the spring when poisoning can endanger the spawning cui-ui in the lower river. In late 2011 a new 110-foot bridge replaced the old ramshackle span, assuring public access for hiking, bicycling, and fishing. 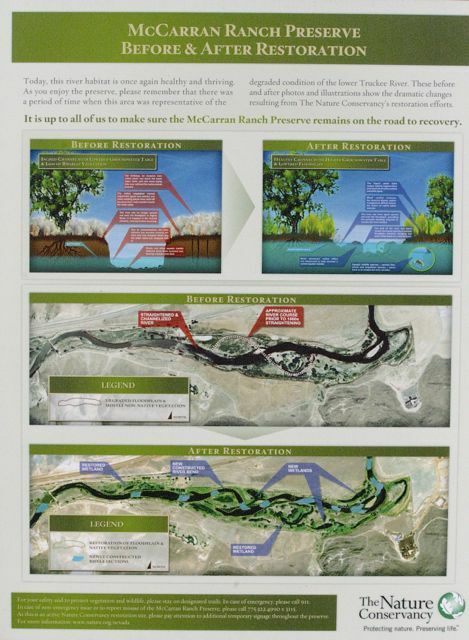 In 2008, the conservancy embarked on its first two restorations officially associated with the flood project: the 128-acre 102 Ranch, acquired by the Bureau of Land Management (BLM) in 2006, and the Lockwood Mobile Home Park, acquired by Washoe County and the Truckee River Flood Management Project in 2002-2006. At the 102 Ranch, some 20 miles downstream from Reno, the river had been harmed by an old gravel pit that had been breached during the floods of 1994 and 1997, filling it with water and changing the river’s course. The restoration created three river meanders, five wetlands, and six cobble riffles while revegetating about 115 acres. About 60,000 tons of rock were used for the entire project. All of this work improved water quality and instream habitat, mitigated flood flows, and reduced rampant whitetop. River access was enhanced and so was recreation, with pedestrian and bike trails. The project extended along 1.25 miles of the river. That same year, the conservancy also began restoration efforts for twenty-nine acres some 10 miles downstream at Lockwood. A meander replaced the straight line that the corps had created, a change that had forced the river to dig itself into a four-to-five-foot-deep trench, depressing the groundwater table. The conservancy also created eight riffles, two wetlands, and twenty-eight revegetated acres as well as onsite parking, bike racks, restroom facilities, picnic tables, a launching area for rafts and kayaks, interpretive signs, and a non-motorized, multi-use trailhead leading to a half-mile walk along the river. Some 130,000 tons of rock were added. The plan included removal of a mobile home park that was severely flooded in 1997 and later condemned by the Federal Emergency Management Administration; much of the land was acquired by Washoe County and the remainder by the flood project. Restoration eliminated noxious weeds and restored native plants, thus providing effective habitat for mule deer, skunks, rabbits, ducks and songbirds. The eroding bank was armored to protect property on the other side of the Truckee. Thus the site was being reconnected to its historic floodplain. In 2009, work began at the site of the famous (or infamous, depending on your outlook) 250-acre Mustang Ranch brothel made famous by Joe Conforte and seized by the Internal Revenue Service in 1999 for back taxes. Later some one-and-a-half miles of riverfront property were acquired by the BLM, with restoration in mind. As with the other projects, the area would be revegetated, natural meanders restored, habitat improved, and some 22,000 tons of rocks used to create riffles. But first an underground jet-fuel pipeline had to be relocated to dry ground north of the river. Then the river’s two channels would be rejoined by removing the earth barrier between them. In all, some 400,000 cubic yards of dirt were moved and 60,000 tons of rocks deployed. Next on the agenda was the Tracy Power Plant project, with designing beginning in 2010 for five meanders, six riffles, one backwater wetland area, various swales and scour channels, and the planting of native vegetation over about fifty-five acres. NV Energy donated a conservation easement to help permanently protect the site. The project was substantially completed in 2013, with the planting of native vegetation continuing into 2014. At this time, the restoration projects covered some ten consecutive miles of the river. Other sites in the ecosystem restoration plan included the Granite Pit just upstream from Tracy—and, downstream, consecutively from the 102 Ranch—Eagle Picher, the Ferretto Ranch, the “railroad cut,” the I-80 rest stop, Wadsworth, and a spot above the I-80 bridge near Fernley. But in 2013, the sites downstream from Tracy were deleted from the Truckee flood-control plan when it was scaled back due to rising costs and the uncertainty of federal funding. This seemed to threaten an end to the restoration, but the conservancy promised to continue the work with alternate funding. Water bender > The Nature Conservancy is going to start another restoration project on the Truckee River at the Tracy Power Plant soon.